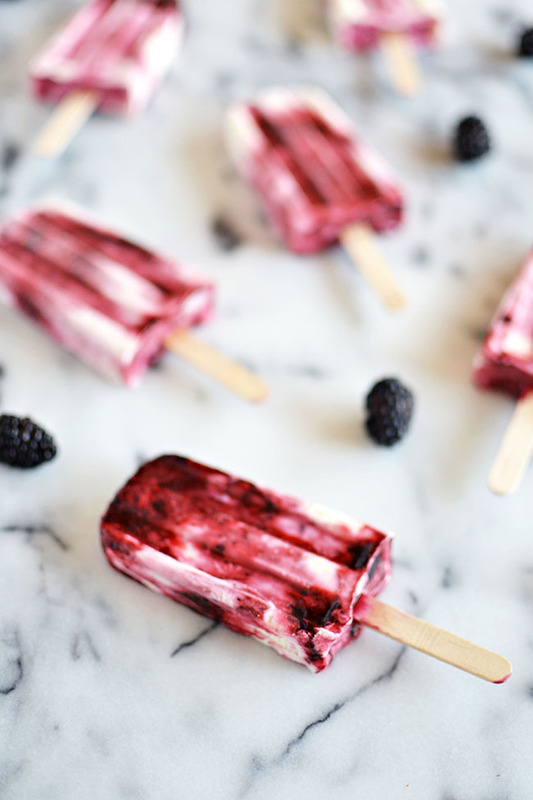 On hot summer days when you don't dare turn the oven on, you find ways to turn baked desserts into frosty frozen treats. 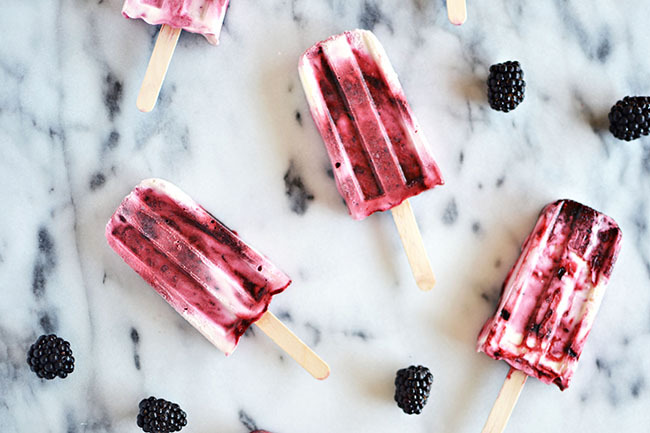 These blackberry cheesecake pops are just that solution. 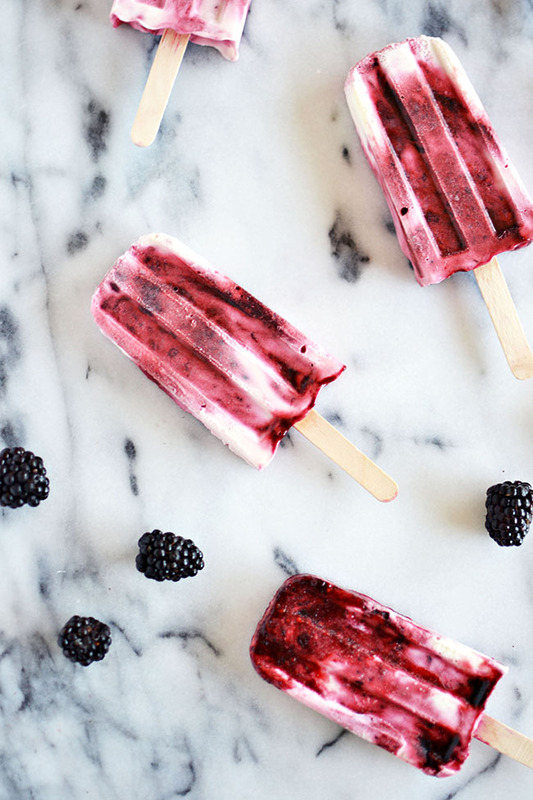 Creamy cheesecake with jammy local blackberries make these pops just as rich as the real deal while keeping you cool and poolside. And for whatever irrational reason, I feel less guilty for eating two three pops in a row rather than its sliced alternative. 1. Place the blackberries, water and jam in a medium saucepan. Stir together ingredients and cook on medium heat for approximately 15 minutes, until mixture becomes soft and jammy. Taste (be careful, it’s hot) and add sugar if needed. Make sure sugar is completely dissolved. 2. Pour blackberry mixture into a blender and puree according to your preference. I wanted the texture of the blackberries to remain so I just pulsed it a couple times. If you want it completely smooth, puree completely. 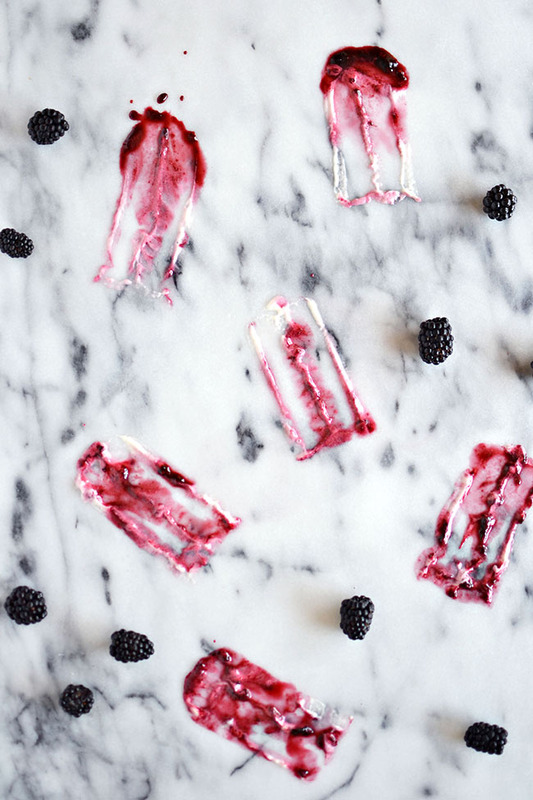 Let the blackberry mixture cool in the fridge while you make the cheesecake mixture. 3. In a mixer or blender, beat the cream cheese, milk, vanilla and sugar together until completely smooth. 4. 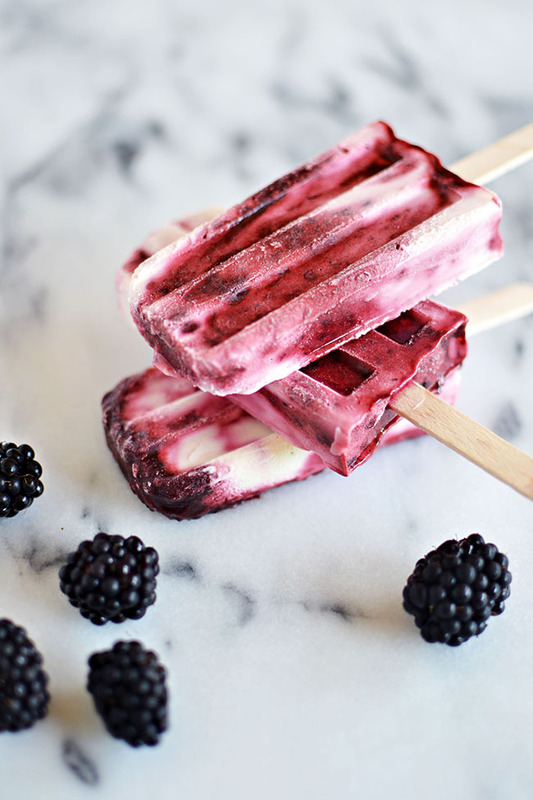 Once the blackberry mixture is cooled, it’s time to start assembling! 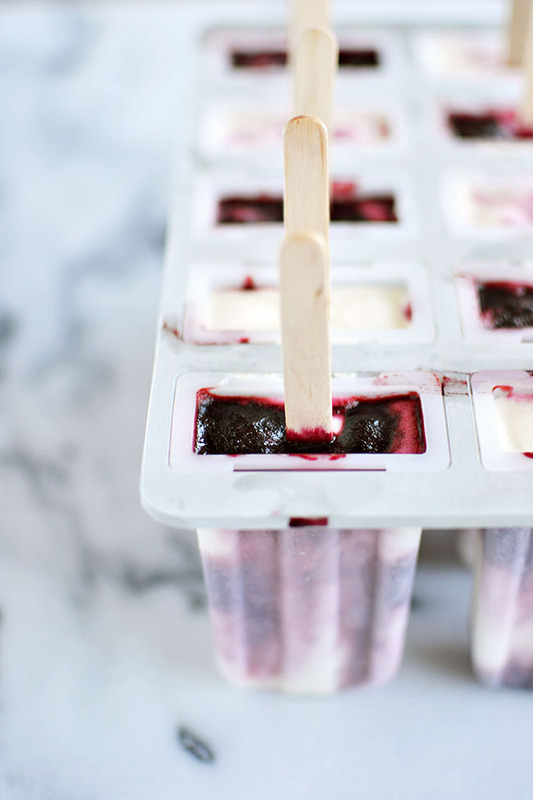 Fill the mould ¼ of the way with cream cheese or blackberry. Next, fill the mould half way with the alternative mixture. 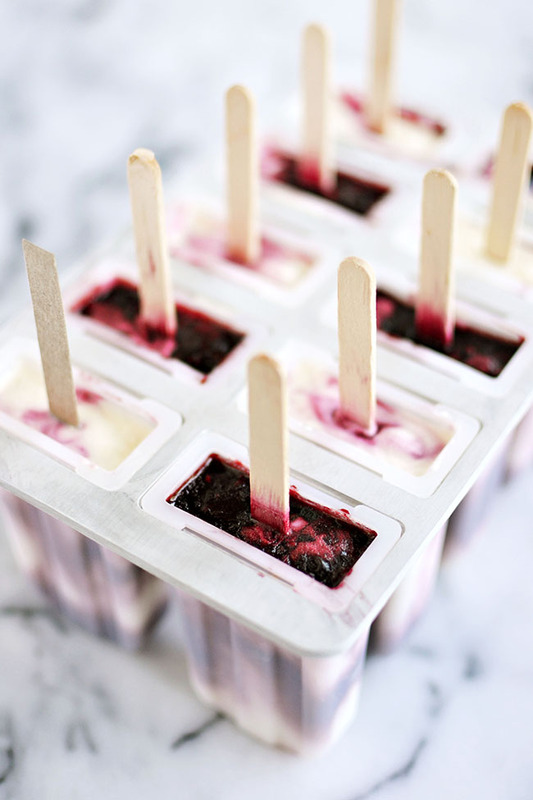 Take a popsicle stick and lightly swirl the mixture together. Repeat this with the next two layers. Make sure to fill moulds leaving a little room at the top to allow for expansion when freezing. 5. Insert sticks into moulds and freeze for 5-6 hours, or until solid. 6. To remove pops, dip mould into a bath of warm water (without wetting the top) for a couple seconds. Lightly pull them out. Enjoy! * I made these pops twice and I found stirring the layers together helped in preventing the pops from breaking at the layers. * If using wooden sticks, soak them in a cup of warm water while you prepare the mixture. This is a trick I learned from the People's Pops book.